I love the humor you use here! I watched this one, too and was a little disappointed there was nothing new. The boy switch and the other man/woman thing I find ridiculous–ARthur Dudley, I’m not so sure….lots to think about there and I just like the idea of him, even if he was a mere pawn in the England/Spain game. Thanks! Oooh! I had no idea this was on. I probably will miss it on Tuesday as I’m working at that time, but hopefully they’re replay it some other time soon! I have to admit, I don’t really know a lot about Elizabeth. She just doesn’t fascinate me as much as her mother does. I have to laugh at their stupid assertion that Elizabeth wore a ruff to hide her adam’s apple! Clearly it wasn’t visible when she wore open ruffs. Or when she was a teenager in that lovely red gown of hers in the later 1540s! One does wonder why this silly assertions are made! In short, it looks like the program did everything other than simply celebrate the life of an extraordinary and clever woman – which is what she was, of course. Oh well … gets the punters in and sells the ads. Education is never the main brief with this kind of stuff. Oh Good Heavens. National Enquirer is spot on. Great recap! Now I don’t need to see it! Ha ha. LOL! ha, again, your humor is really a marvel in your writing! Thnx for sharing. I located a quote from “The Lives of the Kings and Queens of England,” edited by Antonia Fraser, pg. 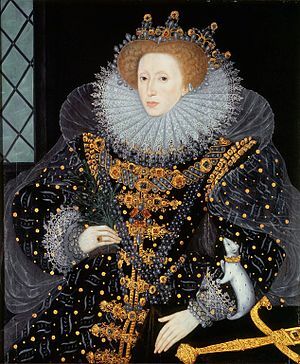 204, “Elizabeth caught smallpox in 1562 and seemed near to death. Ministers discussed who might succeed her, which was no longer an academic question, especially as they were ‘nearly as many different opinions as there were counselors present.’ She, of course, did recover, and in my mind as she said to her forces in 1588 at the Spanish Armada, she “might have the heart of king,” but a body like one, too. So, it has been documented about the hair, face, but the face also means as much to a woman as the face, and this is about the period (and Elizabeth was reported to have worn them before Mary 1’s death), as a fashion statement, and as a cover up as well. Elizabeth had alway been concerned that Mary, Queen of Scots was prettier than she, so English fashion had be a contest to the Scots as they were to France. After all, Catherine de Medici was Mary, Queen of Scots former mother-in-law. Thank you! I have got to laugh at the entire theory, and National Geograph should be ashamed of itself. Money for grant research is given to the best proposal, and I suppose this might have been of use to some foundation, etc., but at least National Geograph got viewers…of any more than that I will not entertain comment…Thank you! National Geograph is usually not very good at history, as they rarely have “real” documentation to back it up. That is why I leave sources(in this comment I cited two sources reply as to why Elizabeth I started wearing a collar after her bout with small pox in 1562, etc.) in my replies as evidence of where I go and what I’m thinking. I do not guess on things, and I might have been wrong about the collar, of which I cannot substantiate. but at least my sources were there. I agree with the AnneBoleynfiles administrator that Eric Ives is “the” source on Anne Boleyn, and so on….Thank you! The National Geography special “Inside the Body of Henry VIII” is quite good, though. It is strange to me that both specials were produced by the same network, given the differences between the specials. SORRY but u’r website still is awesome!!! It isn’t any wonder that she was to remain single after all she’d seen with her dad and his many wives for her to decide not to take a husband and let control over to him! I believe that she was and still is possibly the best Queen that this Country has seen! Held her own when needed but would turn on the female role when she needed to to get what she thought was right for the country. I believe she was a brilliant woman and Queen! i thoroughly enjoyed this program!!!!! Im obsessed !!!! Too absurd for words. amazing that anyone could believe this nonsense. Henry VIII was not the world’s best father, but even he would have noticed if a boy had been substituted for his daughter. There is no mystery about her staying single, her feelings about marriage were always ambivalent, she had seen the problems that being a married queen regnant had caused her sister. she wasn’t keen on sharing her power. And how could she possibly have had a baby without anyone noticing? Too absurd.